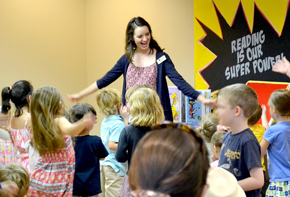 Classes, homeschool groups, scouts, clubs, camps and daycare groups are all welcomed at the St. Tammany Parish Library. Tours, special presentations, instruction and storytimes may be available. If your group would like to visit the library for a field trip, please call the branch at least three weeks before you would like to visit, so that we can accommodate you. If your class or group is working on a specific assignment, please let us know as soon as possible so that we can have resources available. If you would like to schedule a special storytime program, please contact children's services staff. Please be aware that we may not be able to offer your group a tour or special presentation because of staffing or we may not be able to accommodate you on the date you request. We will try our best to ensure your group has a productive and fun visit to the St. Tammany Parish Library.